Fashion may not be the first thing to come to one’s mind when thinking of political protests. 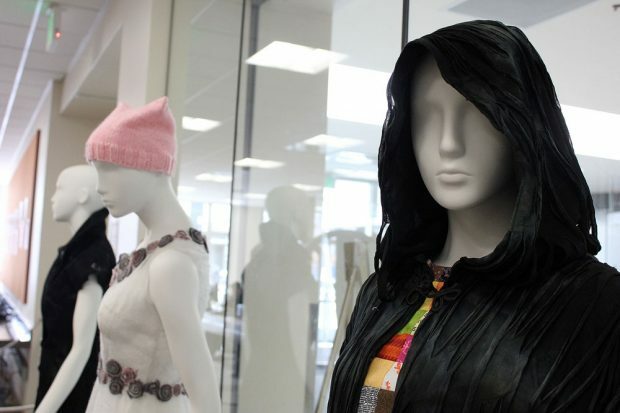 Salt Lake Community College’s Fashion Institute has created two exhibits, titled “Dressed to Protest: Fashion for Social & Political Unrest.” The dresses on display are centered around taking a variety of issues that students felt strongly about and transforming their thoughts into tangible and visual expressions of their own ideas. The exhibits also feature historical pieces from the SLCC collection. 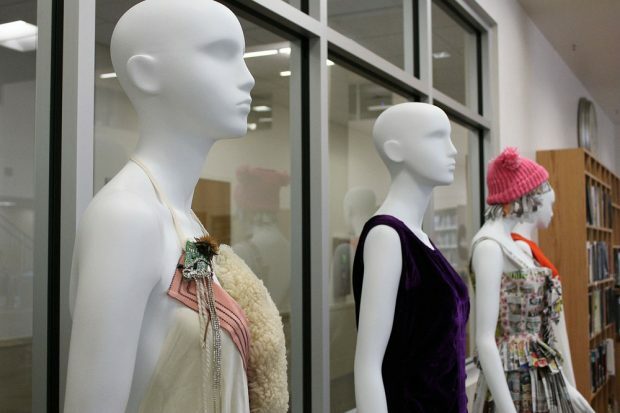 The exhibits were created by Fashion Institute adjunct instructor Melissa Clark, who approached SLCC Fashion Institute Director Mojdeh Sakaki about opening up an exhibit to allow the students to showcase their work. Clark first came to Sakaki to teach the 20th century fashion class that had been dormant for several semesters. Students and faculty both contributed to the exhibits. This is the first exhibit from the class but Sakaki and Clark both hope to make this a regular thing every semester. 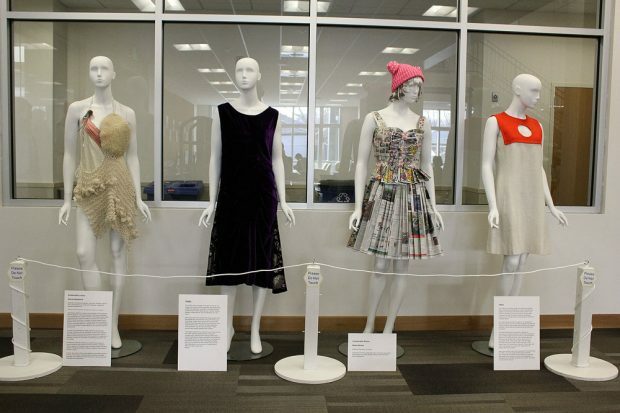 Students from the 20th century fashion class and other fashion classes made the dresses themselves. The causes ranged from the opioid crisis, mental illness, gun violence; famous women in history who defied what society told them to wear at a time in history when it wasn’t okay for women to dress how they wanted, and even some peace, love, and rock and roll. Both Sakaki and Clark see this exhibit as a “spark” to ignite the conversations that may be uncomfortable to some, but necessary to others. Clark constructed a dress that was titled “Patchwork Community” and was designed to reflect on society being a patchwork of people and ideas from all sorts of unique places and perspectives. The dress was held together by safety pins, a nod to the safety pin movement that started to show people they have a place to feel safe in the world amid increased instances of xenophobia over the last few years. All the promotional posters were created by the students. Using the library to house the exhibits didn’t cost the department any money and allowed for resources to be allocated toward future endeavors of the department. The exhibits are open from now until Friday, Feb. 2 at both the Taylorsville and South City campus libraries, during regular hours. The idea behind splitting up the exhibits was to maximize audience, as South City is a venue for Sundance Film Festival. Sakaki is hoping the film goers will stop by and see the student’s work. On the final day of the exhibit, there will be a question-and-answer session with the students who made the dresses to allow them to further explain their thought process and how the dress reflects the issues they are passionate about.